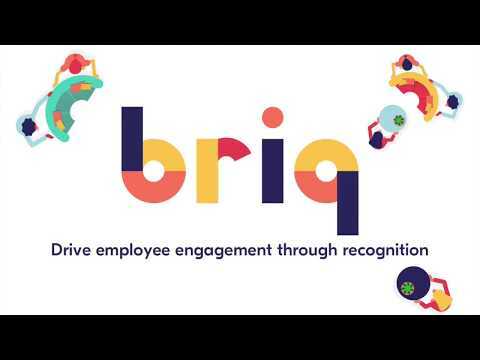 Briq is an employee rewards and recognition software, based on a virtual credit system: briqs. It's been designed to help HRs and managers increase employee engagement by giving recognition and rewards on a regular basis. Briq fosters peer-to-peer recognition and extra-miles along company's values and business priorities. Employees can redeem their briqs in a customizable Bootiq in order to get rewards that matter to them. Briq helps foster a culture of appreciation and feedback that is in alignment with a company culture. Briq’s API can be connected to any software or processes running inside a company. The software allows users to offer non-monetary and monetary rewards, collective items, or individual items, depending on the policies and values of the company. Briq’s catalogue contains more than 150 reward ideas to help users create their own items. HRs and managers can also measure the impact of initiatives, empower employees and monitor team dynamics using the data collected from Briq's coin exchanges. Briq also provides an overview of an employee’s strengths and weaknesses, giving them guidance on how to improve their performance. Briq is directly installed in our chat platform (Slack). Everyday, we're encouraged to give positive insights and feedback to our teammates, and we're rewarded when going the extra-mile. I for instance am in charge of the marketing: I can invite the teams to share the articles I want...what they can do in one click, directly from Slack. I like the fact that it's really easy to use. Briq key advantage is to be global and connected to most of existing solutions. It's not an employee-advocacy tool per say, Briq helps developing a positive culture more globally, with everyone feeling involved and wanting to go the extra-miles - among which, the sharing of content on social media. That's important because in this way teams are already onboarded and don't have to use a 50th tool. I like the fact that it's really easy to use. Briq key advantage is to be global and connected to most of existing solutions. It's not an employee-advocacy tool per say, Briq helps developing a positive culture more globally, with everyone feeling involved and wanting to go the extra-miles - among which, the sharing of content on social media. That's important because in this way teams are already onboarded and don't have to use a 50th tool. Briq main drawback comes from its strength: it's full of possibilities so you often feel you could benefit from it even more, deploy other use cases, celebrate every type of milestones. Fortunately the onboarding & success teams are pro-active regarding it! Many thanks Laure for you review! It's sure we can do a lot of thing with Briq :D We now help briqsters to navigate through the different features thanks to a new onboarding process, as well as features' notifications. And you're right, our support & success team is always ready to give a helpfull hand! Briq gives value to our values! With Briq, we've been able to create actions behind the words by giving our employees the possibility to spread our values by themselves, by sending Briqs (virtual rewards) to their teammates with dedicated "thank you" messages. There is something really fair behind this tool, which is that "the more helpful you are, the more you get from it". Because if you help many colleagues, they will send you briqs, and with those briqs, you can by products on the online shop we created for that. Once you understand who Briq works, it becomes addictive! :) It help us spread kindness and good values within the company. Without making employee lose time, it helps create good interaction and bring something really positive within the company. It help us spread kindness and good values within the company. Without making employee lose time, it helps create good interaction and bring something really positive within the company. There's nothing I don't really like... The company is young and developing many new features to come. The customer support is great and as a client, I feel like my ideas are listened and help Briq to build their roadmap. Also, it's a pretty awesome way to give kudos to team members and show them that their work matters ;)Briq's share app helps gamify sharing company social posts. By using Briq we were able to create higher reach, engagement, and ROI on our social media marketing efforts as well as get other teams more likely to share what we were working on (launches, events, content, ...). Briq's share app helps gamify sharing company social posts. By using Briq we were able to create higher reach, engagement, and ROI on our social media marketing efforts as well as get other teams more likely to share what we were working on (launches, events, content, ...). Literally nothing. It's dead simple to use and implement and showed immediate impact on our key social media metrics. Thanks Jonathan for the review! We're very pleased to know you don't see any cons about Briq. Don't hesitate to give us ways of improvement if you can find some! Best regards, the Briq team. Increases team motivation to help each-other .Briqs are a really nice way to thank a colleague for his help or to bring joy to a friend ! Also sets team goals to reach an amount of briqs in order to do something together ! Briqs are a really nice way to thank a colleague for his help or to bring joy to a friend ! Also sets team goals to reach an amount of briqs in order to do something together ! It's not always easy to use for newbies. I think a more complete explanation could be useful. Many thanks for your review! We agree with your comment, that's why we worked on the onboarding and we now walk you through Briq's main features when it's your first connection. We'll continue to better the onboarding process thanks to features' notifications, according to how you use Briq. Don't hesitate if you have other suggestions! Thanks Shahin for your comment, and happy to know you find Briq great! It is correct briqs have a limited lifetime: 365 days. If you don't spend it in the Bootiq within one year, they expire. We'll make sure this information is known by the briqsters. Best regards, the Briq team. Enterprise (ideal for 1000+ users): Contact Briq for pricing information. • Teammates can share Briq coins on an everyday basis for various actions that come under a company’s culture and values. • Briq allows admin users to create a Bootiq - a customizable rewards store - as part of their employee performance incentive programs. • All rewards on a Bootiq can be customized to align with the culture of a company. Users can choose from more than 20 categories including goodies, charity, wellness, team building and career growth. • Team members are allowed to exchange Briq coins to get whatever they want from the Bootiq or contribute to a collective purchase for group rewards. • Employees can have an overview of their performance thanks to a personal digest. HRs and managers have access to a global dashboard. • HRs and managers can send pulse surveys in order to collect feedback from teammates. Below are some frequently asked questions for Briq. Q. What type of pricing plans does Briq offer? Q. Who are the typical users of Briq? Q. What languages does Briq support? Q. Does Briq support mobile devices? Q. Does Briq offer an API? Yes, Briq has an API available for use. Q. What other apps does Briq integrate with? Q. What level of support does Briq offer?